OSNEXUS Cloud License Service dispenses QuantaStor license keys via REST API and scriptable CLI for enterprises that require fully automated storage deployments. Cloud service providers (CSPs), managed hosting companies (MSPs) and enterprises that require fully automated storage deployments of QuantaStor SDS on physical hardware or as virtual storage appliances (VSAs) with month-to-month billing can provision their storage license capacities online through the QuantaStor Cloud License Service (CLS) portal. In addition to the CLS, the OSNEXUS Capacity-as-a-Service (CaaS) license for QuantaStor SDS enables enterprises to dynamically manage and provision their storage license capacities. Partners and customers using the Cloud License Service (CLS) are billed at standard subscription rates plus a fee for the CLS portal simplifying internal chargeback accounting and automation activities. QuantaStor SDS license keys can be dynamically provisioned and retired for self-service management of license capacities, enabling easy expansion, contraction, and deployment of new appliances on demand with the Capacity-as-a-Service (CaaS) license. 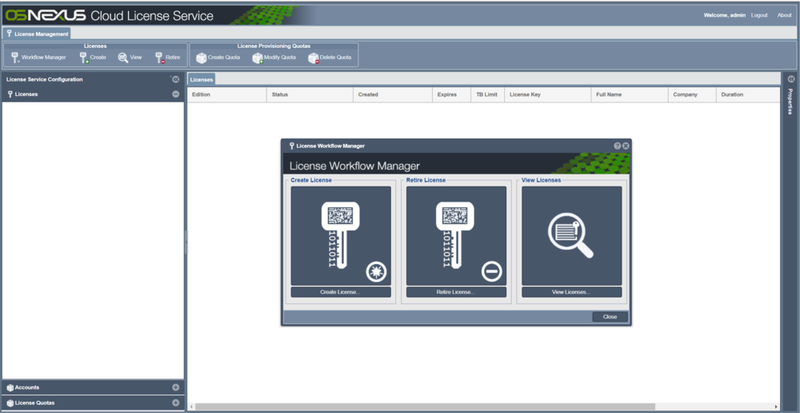 CLS instances are pre-configured with quota(s) indicating the purchased subscription license key capacity. The available capacity can be divided up to meet the storage capacity needs of few or many appliances of any size with a minimum license key size of 32TB per appliance. Previously deployed QuantaStor SDS appliances can be retired at any time and returns its capacity so it can be re-deployed elsewhere as a new key or to expand an existing deployment. QuantaStor appliances with keys provisioned from the CLS portal will automatically contact OSNEXUS to indicate that the license keys are active in order to ensure accurate billing every month.